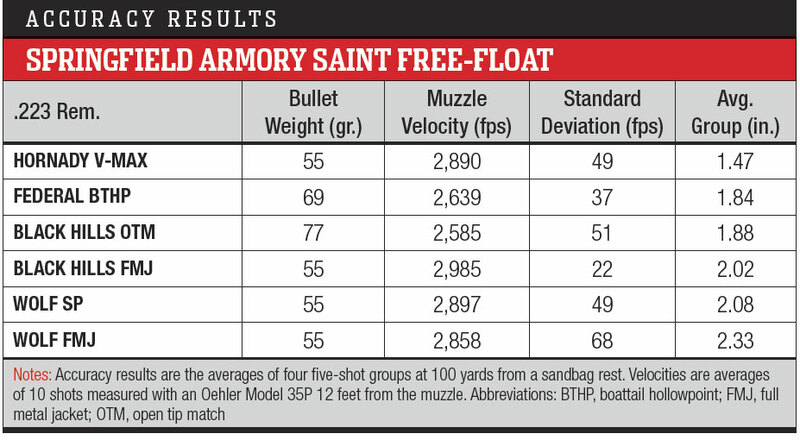 The Springfield Armory Saint Free-Float 5.56 NATO is still a reliable, accurate rifle for a historically reasonable price. Springfield Armory made a lot of news in late 2016 with the Saint. Not only was it the company’s first AR-15 pattern rifle, but aslo it offered a great combination of features for a price roughly $300 lower than any of its competitors. I wrote at the time that Springfield Armory moved the goalposts for what an “entry-level” AR could and should be. Now the company is back with the second rifle in the Saint series: the Springfield Armory Saint With Free Float Handguard. No, seriously, that is its full, actual title. The Saint is a direct-gas-impingement design and sports a 16-inch chrome moly vanadium barrel with a corrosion-resistant Melonite finish inside and out. Instead of the standard M4’s carbine-length gas system, the Saint has a mid-length gas system. Compared to a carbine-length gas system, a “middie” gas system not only slows down the speed of the bolt and carrier to reduce wear, but also helps reduce recoil. The Saint’s barrel sports a 1:8 twist, which is believed by most people to be the optimum twist rate for the widest variety of bullet weights. The Saint also has a 5.56 NATO chamber, which means it can safely digest either .223 or 5.56 ammo. The gas block is a pinned, low-profile design. The upper receiver has M4 feed ramps and a forward assist. On the left side of the lower receiver, you’ll see Springfield Armory’s crossed cannons logo. On the right side of the magazine well, you’ll find the SAINT name in big letters. Inside the lower receiver behind the trigger you’ll notice something blue. That is the polymer tip of Springfield’s Accu-Tite Tension System, a nylon-tipped tension screw designed to bind against the upper receiver to reduce play and thus increase accuracy and reliability. It’s a nice addition, but I don’t feel it’s a useful one outside of über-accurate match guns. The trigger components of the Saint have been given a nickel boron coating, which is not only corrosion resistant but slicker, providing a slightly smoother and lighter trigger pull than standard GI-style fire-control parts. The trigger pull on my sample was six pounds and free of grit—functional, but not exactly match grade. The Saint has an M16 bolt carrier. The gas key is hardened and staked per USGI specifications. The bolt is made of Carpenter 158 steel, shot peened and magnetic particle inspected. The extractor spring comes with an O-ring to provide additional tension. Springfield went with the heavier H buffer in the Saint, which helps tame recoil. The blue “nub” you see in the photo is the polymer tensioner system for a tight fit. Instead of sticking a standard carbine buffer inside the rifle, Springfield went with a slightly heavier H buffer to help reduce the speed of the moving parts—and recoil—even more. It rides inside a mil-spec six-position buffer tube, and the castle nut on the buffer tube has been properly staked. The stock on the six-position buffer tube is Bravo Company’s BCM Gunfighter, which is a robust, rattle-free design. The grip has a more vertical angle than the original GI A2 pistol grip. The BCM Gunfighter offers a rubber buttpad and ambi QD sling sockets as well as an old-school slot for a sling. The rifle also sports a larger polymer BCM trigger guard. 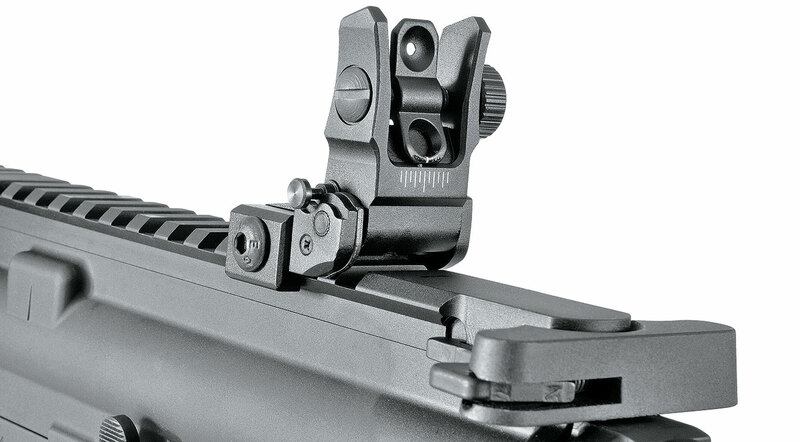 The sights on the rifle are Springfield-marked UTG Leapers low-profile flip-up sights, which Tarr loves. 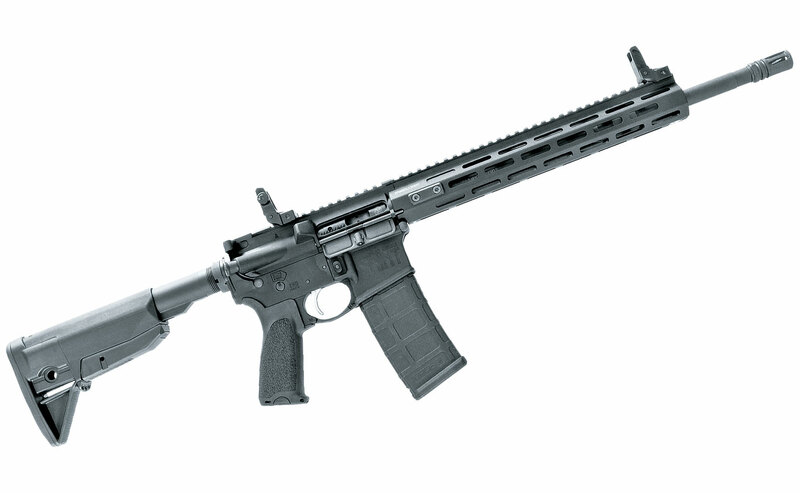 As you’ll surmise from its name, this version of the Saint features a free-floating aluminum handguard, one with M-Lok attachment slots. And this model has a flip-up front sight instead of the original’s fixed front sight. The result is a gun that’s two ounces lighter than the original. 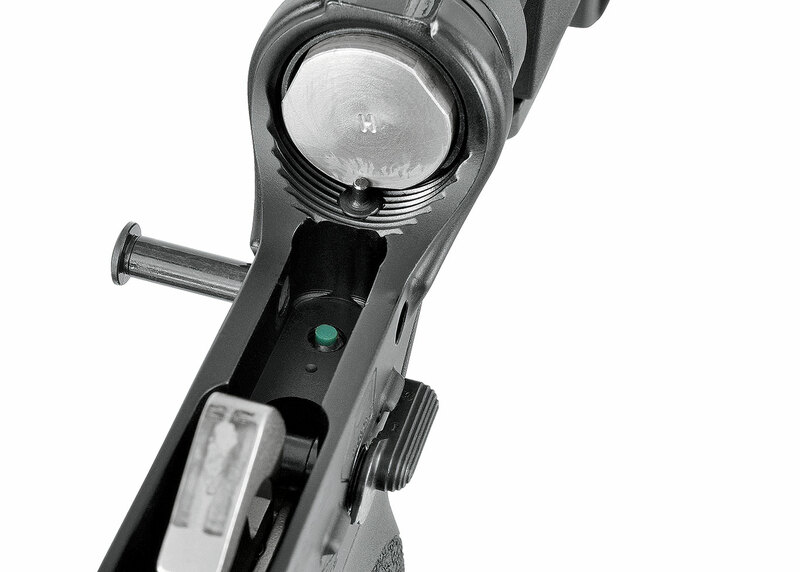 The sights on the rifle are Springfield-marked UTG Leapers low-profile flip-up sights, which I absolutely love. I think these are the best value for the money in flip-up iron sights—period. The 12.5-inch aluminum handguard looks like a slightly modified version of the UTG Leapers PRO handguard, which is an attractive, functional piece that is 1.5 inches wide. It looks good and feels good in the hand and offers no end of mounting spots for vertical grips, lights, slings, etc. The big change with this Saint is the aluminum free-floated handguard. And unlike the standard M4, the Saint uses a mid-length gas system. At this point, I’ve fired or seen fired thousands of rounds through Springfield Saints. I have yet to see a malfunction that wasn’t ammunition related—and then only three of those. These are solid rifles that run and run and run. Most of them also seem to shoot under two m.o.a. if not substantially better. The basic M4-style AR, with a 16-inch barrel, carbine-length gas system and GI furniture, has been the “entry level” AR for a number of years now. 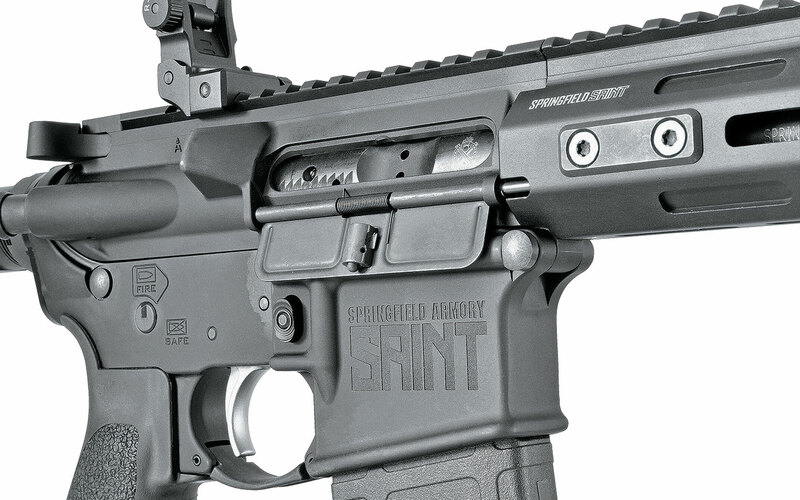 With the Saint, Springfield Armory moved the bar. It is not just prettier but superior in function and performance to a GI-style M4. I don’t know why anyone would now settle for anything less. However, with AR prices still falling marketwide, and the $150 upcharge for the new handguard and front sight, this Saint is not the screaming deal that the original version was. That said, it is still a reliable, accurate rifle for a historically reasonable price.